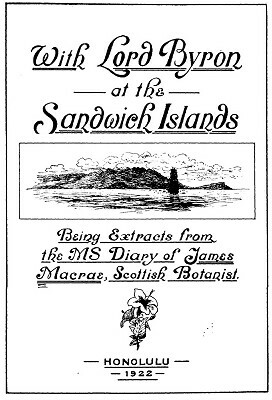 James Mcrae : Aquatic Sandwich Islanders, 1825.
being extracts from the MS. Diary of James Macrae. Edited by William Frederick Wilson. Note several other accounts from the voyage of the Blonde. Extracts from Voyage of the 'H.M.S. Blonde' to the Sandwich Islands, John Murray, London. 1826, pages 97 to 209. Extracts from Diary of Andrew Bloxam, Naturalist of The "Blonde", Bernice P. Bishop Museum, Honolulu, 1925, Volume 10.
most of their time sitting or lying down asleep on mats. But the whole tribe is so fond of bathing that the sea shore is seldom seen without numbers of both sexes swimming with perfect ease, as if some speceis of aquatic creatures. June 2. Queen Kaumanna and Pio,with several female attendants, called in their carts. They were very inquisitive to know if Mr. Forder and I were married men. Being told, yes, they wanted to know the number in our families. Mr. Forder, who kept up the conversation, said he had six and I none, on which they said I could only have one wife. After a few more questions, they left us to bathe, as usual, in the fish pond, near here. A little before dusk, the king called on horseback, accompanied by a little boy brought out from England by Boki. on a native boy's back, some distance in front of the old queens, who were dragged in the carts. Geoff Cater (2013) : James Macrea : Aquatic Hawaiians, 1825.